The e-tron has a price tag of €101,750 before grants. The claims for Audi's all-electric e-tron are impressive - a range of up to 390 kilometres , for example - but it comes with a hefty price tag. 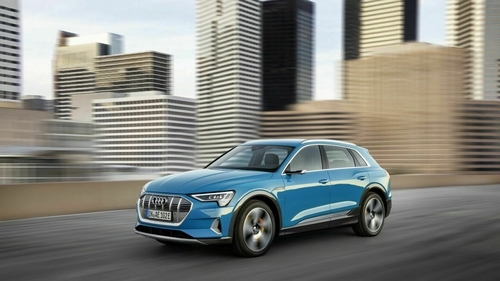 Audi says the range of the e-tron will be up to 390 kilometres and the car can be fast-charged in just under 30 minutes. With 300 kW of power, it won't be short on performance or acceleration - a 0 to 100 KPH time of under six seconds is promised. That kind of acceleration is typical of electric cars, which don't have the kind of torque curves that conventional cars have. The €101,750 full-sized SUV is driven by two electric motors and Audi says up to 30 per cent of the car's range can be achieved by the use of regenerated energy from braking and coasting. It comes with Audi's full-time Quattro four wheel drive system as standard. It's not just the source of power for the car or its range that Audi has been innovating with. It has even done away with wing mirrors. Small cameras now replace exterior mirrors, relaying the car’s surroundings to LED displays housed within the front doors. Blind spots are eliminated and the field of vision is expanded, while air-flow is improved and wind noise is reduced. The e-tron has a panoramic glass roof that not only provides more sunlight, but also generates more efficiency for the car. Developed with integrated photovoltaic cells, the sun-roof actively generates energy for the air conditioning and heated seats. The e-tron benefits from usual grants for electric cars, including a VRT rebate of €5,000. benefit in kind tax reductions, an SEAI grant of €3,800 for business use and €5,000 for private customers.